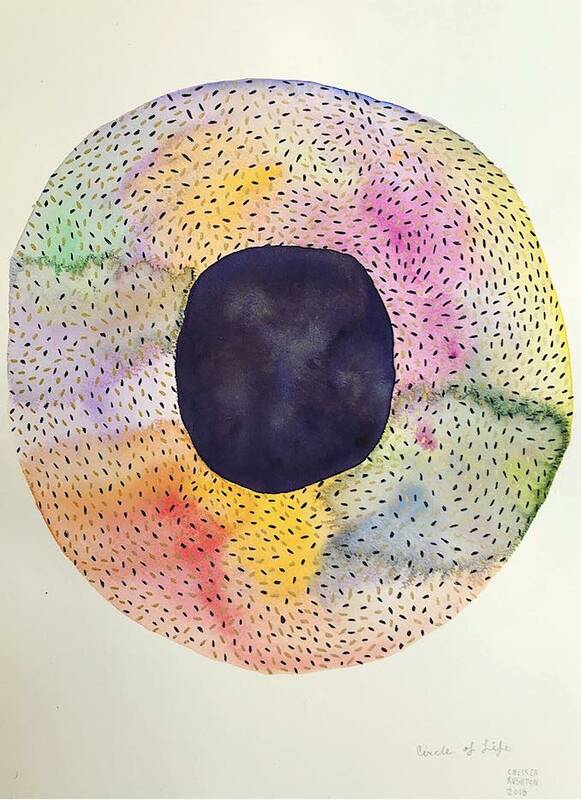 Chelsea Rushton’s work focuses on the intersections of art, ritual, and spirituality. Personal, poignant, and unmistakable, her paintings, drawings, and embroideries explore the intersections of the physical and energetic aspects of the self. By treating the creation of visual art as a contemplative act – as a transcription of visions that arise during meditation – Rushton imbues her works with mystery. Her art invites viewers to wonder at the matter, energy, and spirit in their own lives: to play, to ponder, to hope, to dream. Rushton’s work has been exhibited across North America. She holds a BFA with distinction in Creative Writing from the University of Victoria and an MFA in Visual Art from the University of Calgary, and she is certified at the 500-hour level as a yoga instructor. Her creative endeavours have been supported by the British Columbia Arts Council, the Alberta Foundation for the Arts, the University of Calgary’s Centre for Research in the Fine Arts, and Calgary Arts Development. My day literally never begins before coffee. 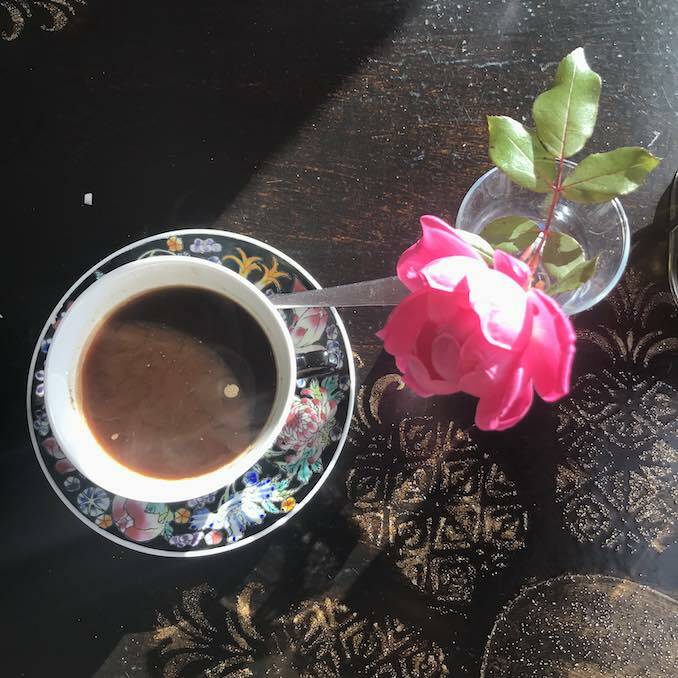 On a good day, it looks like this Turkish coffee, served with a rose at Olive Branch Mediterranean Restaurant in Greenport, Long Island. An exploration of the meaning of life and death in colour: Circle of Life, gouache and graphite on paper, 12″ x 9″, 2018. 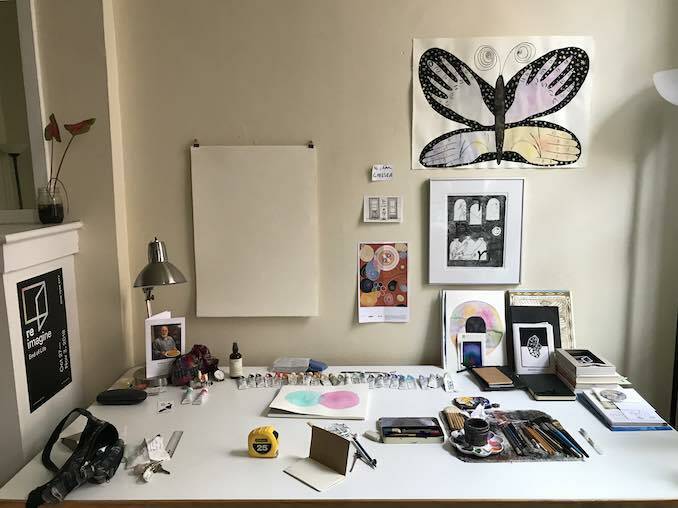 My studio table / Portrait of my brain (featuring, in the top right, Rainbow Butterfly, gouache and graphite on paper, 18″ x 24″, 2018). Even when I’m not working on a big project or series, I try to make at least one drawing a day. 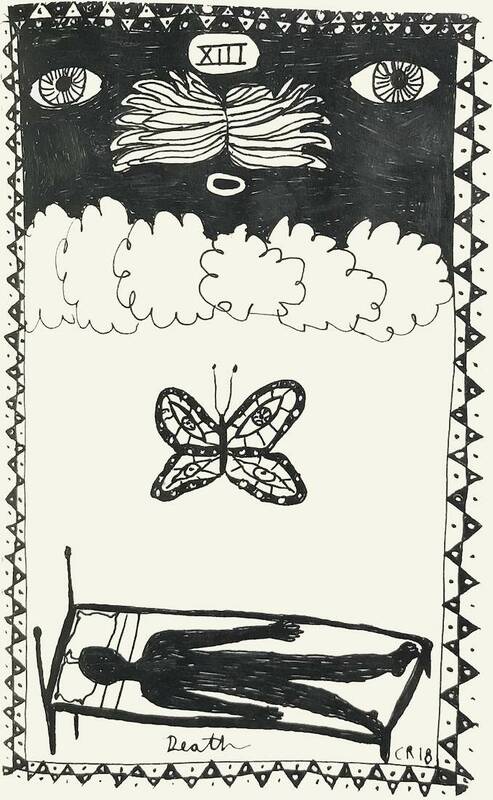 This one is from “The Other Side”, a series of black and white drawings about death and what happens to us when we die: XIII: Death, ink on paper, 5″ x 3.5″, 2018. In New York there is so much art, all the time, everywhere. While I was there, I saw as much as I could to inspire new imagery, processes, and content in my own work. 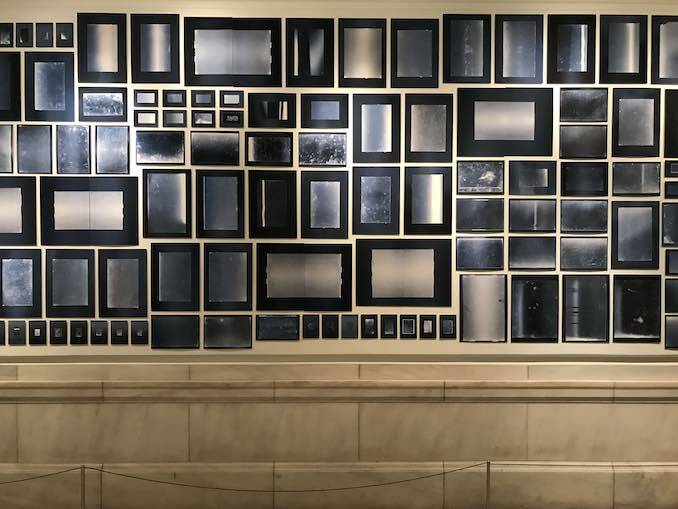 This is an install shot of cyanotypes from Blue Prints: The Pioneering Photographs of Anna Atkins and Anna Atkins Refracted: Contemporary Works, on view at the New York Public Library. What New York’s parks lack in quiet nature time, they make up for in wild social life at all hours of the day and evening. 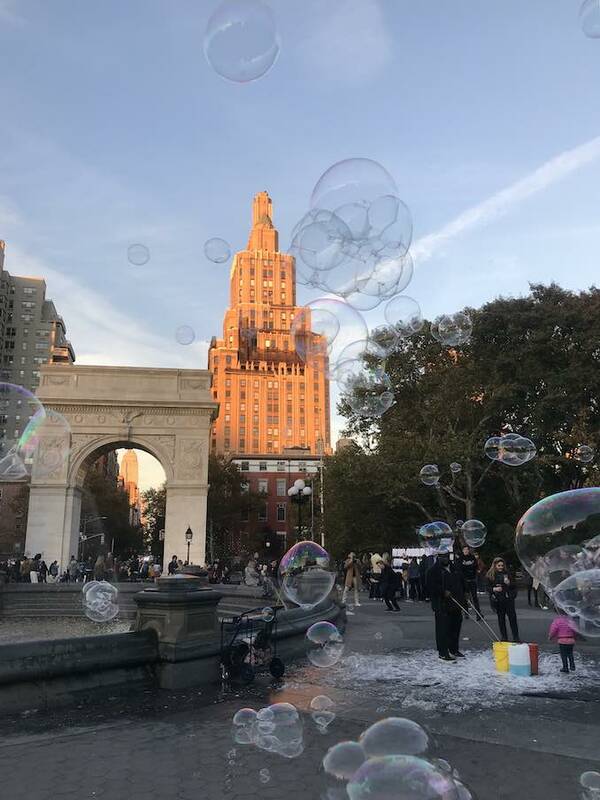 This photo of Washington Square Park at Sundown shows only the man blowing enormous bubbles with a fishing net on sticks. Around him, though, are skaters filming each other doing tricks, artists selling their work, hot dog stands, ice cream trucks, the cart selling political buttons, chess games, dogs playing, a wedding being photographed, and a dude playing a grand piano on wheels in the middle of a walking path. Every day I take a sunset walk to process the events of the day and gather my thoughts and visions for creative work. 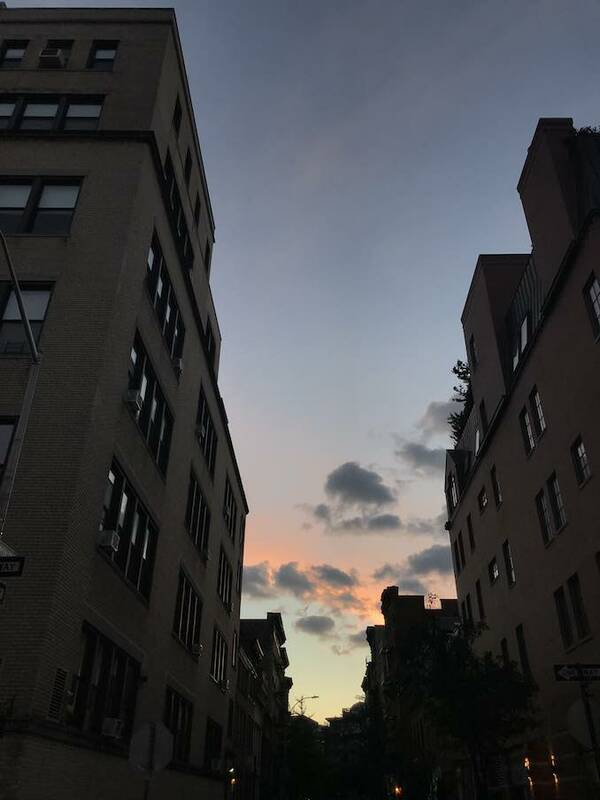 It is sometimes hard to get a good view of the sky in New York (because the buildings can get in the way) but when I do, it gets me right in the heart. Textiles are a longtime inspiration for me, particularly their colours, repetitive patterns, and the monotonous processes required to make them. I find that textiles themselves and the means of their creation facilitate a trance-like state of awareness in me. 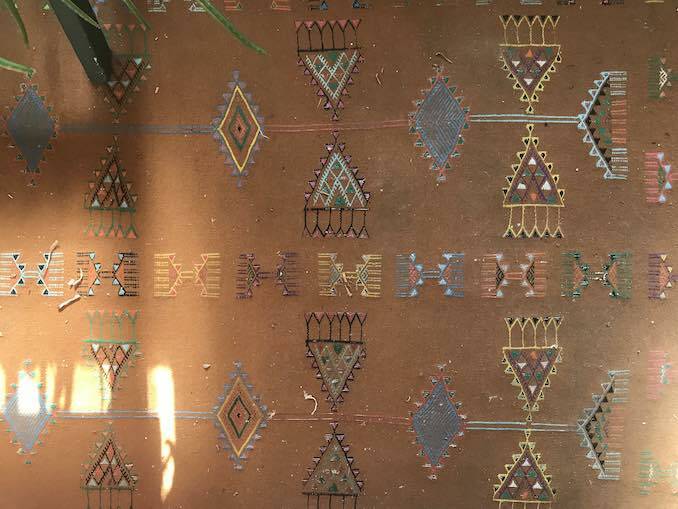 This is a Moroccan carpet in the master bedroom of my friend’s home in Greenport, Long Island. I’m a Lakeview girl, commonly spotted in the Beltline. I was fortunate to spend some of this fall in New York exploring the city with friends and filling my cup, and the photos I’ve included are from that special time. I’m an artist, illustrator, designer, and academic. My work can include any combination of studio time, arts administration, design and illustration work, and writing projects. I like to stimulate my mind in lots of ways and I have created a work life that ensures variety. Following the sudden deaths of both of my parents in 2018, I’m working on a series of ink drawings called “The Other Side”. This series investigates death, one of the greatest and most complex mysteries of life, in black and white terms. I use the formal qualities of positive and negative space as a metaphor for presence and absence in life, and the changing meanings of those terms in death. You can view my work online at www.chelshotel.com, and on Instagram. Inquiries are always welcome.